It's been another big year in premieres, and with a combination of thanks given to Australia, Austria and the United Kingdom and the various convoluted and interconnected definitions of "residency", "permanent residency", "where I happen to live", "citizenship", "freedom of movement", and "European Union" I and they currently work within ... which should remain in place for another 11 months at time of writing, I might have a few more premieres in me next year (cross fingers). But for now, here's the 2017 that was (note : each image is also a link to its journal) - I count 71 events photographed. JANUARY : No premieres - I arrived back from holiday too late! February 9th : We've long since established I'll go to *any* premiere, so... yeah... "Fifty Shades Darker". February 2017 : I may not know fashion, but that doesn't stop me photographing it, at London Fashion Week. February 13th : Just one day after the Baftas, and at a location to secret that the nearby bus stop was still functional... it's the Elle Style Awards! February 16th : A rare premiere at the British Museum : for 'The Lost City of Z', which is apparently not a zombie movie. February 21st : I have nothing bad to say about the movie or premiere of "Viceroy's House". February 23rd : Disney / Marvel doesn't do premieres anymore, they just fly in the stars and don't let the public near them. Meh to that, and to "Beauty & the Beast". February 28th : Awesome lighting (and Brie Larsson!) at the premiere of Kong : Skull Island. MARCH : Only two premieres! March 16th : Confusion and Uncertainty reigns at the premiere of "Another Mother's Son". March 19th : It's the 2017 <insert name of alcohol brand I have no affiliation with> Empire Awards! APRIL : Two premieres in Berlin and this year's "Biggest" movie?! April 4th : I'm in Germany for the Fast & Furious 8 ('Acht'!) premiere! April 9th : Please maintain your respectful decorum for... the 2017 Olivier Awards!! April 12th : the Official (?) premiere might have been at last year's London Film Festival, but 'Their Finest' had a special screening this year too. April 21st : Scoff and/or plead ignorance about the movie "Cain Hill" at your peril - in terms of journal views on this website, it was this year's BIGGEST movie! MAY : Well, at least there's some quantity in lieu of quality? May 8th : It's a movie that stars its writer as its lead (who is not the pictured Ray Winstone, but don't let that negate the wonder) at the premiere of 'Jawbone'. May 10th : The movie might not have been great, but there was (almost) nothing wrong with the premiere for 'King Arthur : Legend of the Sword'. May 11th : One of the least publicised premieres of the year actually ended up getting my website more views than Star Wars : The Last Jedi : "Interlude in Prague". May 14th : And after the 2017 TV Baftas, there's nothing for over THREE WEEKS! JUNE : Documentaries, Royals, Booksignings, Cancellations and Neatness... all in one month! June 7th : After four cancelled premieres (The Mummy, Wonder Woman, and two Netflix releases) - London finally refuses to bow to fear and we have the 'My Cousin Rachel' Premiere. June 14th : For fans of Things Being As They Should Be, excitingly the premiere for the movie 'Hampstead' was held IN Hampstead! June 15th : A documentary about standup comedy followed by a screentalk by a dual-Oscar winning Costume Designer : "Dying Laughing" and a bit of Jenny Beavan. 16th June : Maybe not technically a premiere, but it had pomp and ceremony (plus I hear two two princes had cameos in the latest Star Wars movie and the Queen was a Bond Girl during the Olympics opening ceremony) : Trooping the Colour 2017. June 18th : Professor Laura Haddock explains... whatever her character's degree was at the 'Transformers : The Last Knight' premiere. June 26th : with no premieres scheduled for two weeks, here, have a bonus Neal Stephenson book launch / book signing for "The Rise and Fall of D.O.D.O.". June 26th : And I even got to see the movie! At the 'Baby Driver' premiere. July 13th : Harry Styles wouldn't mind if the screaming stopped for just a few seconds at the "DUNKIRK" World Premiere. 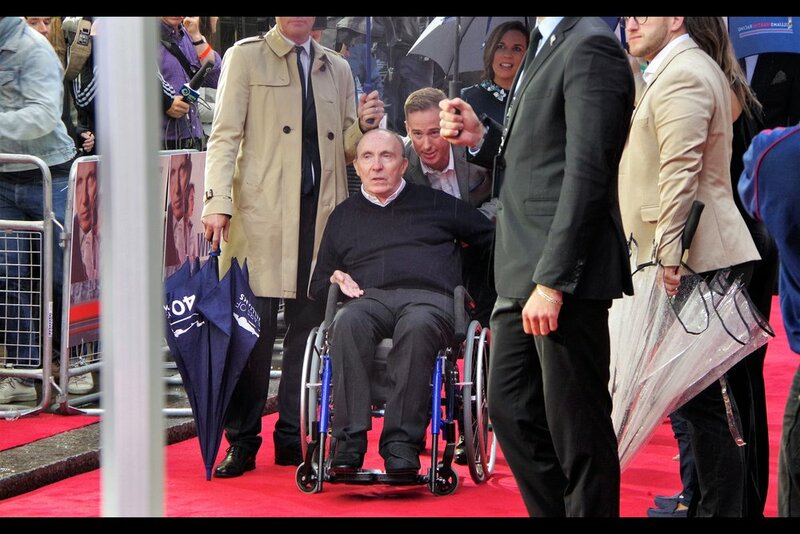 July 11th : Frank Williams at the premiere of the documentary for "Williams". July 24th : Cara Delivingne at the premiere of "Valerian and the City of a Thousand Planets". AUGUST featured the smallest premiere crowd I've been a part of. August 21st : Adam Driver shows signs of dangerous whimsy at the premiere of "Logan Lucky". August 23rd : it was just me and two autograph hunters at "Patti Cake$", and I'd be cynical except I've watched the movie and thought it was good! August 24th : once again we're investigating new lower limits on what can reasonably be called a "premiere" - this one for "Cult of Chucky". SEPTEMBER : Some size, some fashion... and some Latvia. 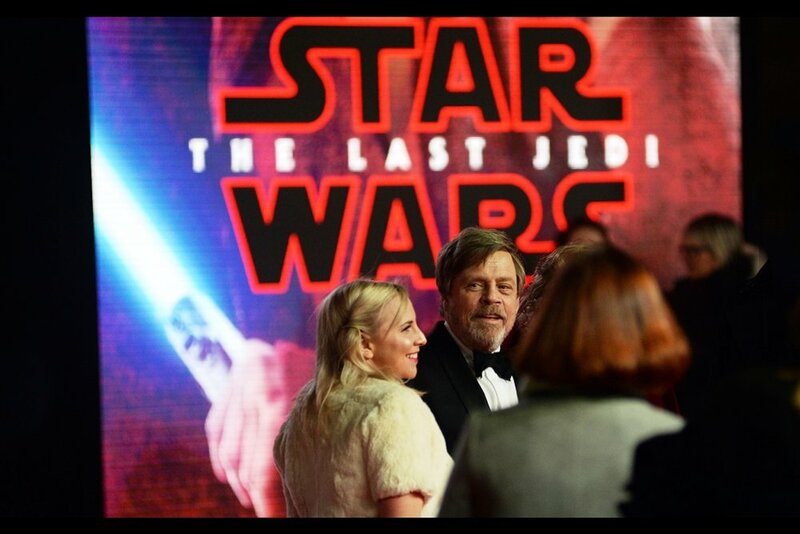 September 5th : This year the GQ Men of the Year 'awards' were at the Tate Modern - and Mark Hamill attended! September 6th : Jennifer Lawrence and Jennifer Lawrence's Dress at the "Mother!" premiere. September 15th (?) to 19th - I only officially did one day of London Fashion Week, so I cheated and added some Latvian 'street' clothing and a Berlin Fashion show. September 18th : Even as a non-fan of The Big Lebowski, I was still happy to photograph Jeff Bridges (at the 'Kingsman : The Golden Circle' premiere). September 20th : "You want me to sign WHAT?" at the "Goodbye Christopher Robin" premiere. September 23rd : Skirting close to almost not being a premiere at all but it's September and I'm desperate and BFI LFF is still a fortnight away... it was the 'premiere' for "Bees Make Honey". September 26th : Not a premiere, but certainly fascinating and movie-themed - the 2017 Prop Store Auction at BFI Imax. OCTOBER: I typically claim that London has about sixty premieres a year, which probably stretches out to about 70 or so events. But the truth is, it's approximately two weeks each year at BFI London Film Festival that contributes almost 1/5th of ALL the events I photograph in any given year! October 3rd : It's a bit of a 'hidden' event that only seems to take place every second (?) year, but BFI Luminous has quite the star power - from Jeremy Irons to Australia's own Baz Luhrman. October 4th : One day after the opening event, it's now the official opening premiere of BFI London Film Festival - and it's for the Andy Serkis directed, Claire Foy / Andrew Garfield starring "Breathe". October 5th : Carey Mulligan is pretty and pleasantly cheerful to fans, autograph hunters, and people who want to photograph her for weird websites with uncertain aims... .like this one! At the 'Mudbound' premiere. October 6th (part II) : barely fifteen minutes after the prior premiere (a barely fifteen minute walk away) - a second premiere for the day, with Sam Claflin for 'Journey's End'. October 7th : First I grabbed a wristband, then I sat down and watched 'Blade Runner 2049' and then I rushed out to grab a (lucky) front-row spot for the premiere of 'Battle of the Sexes'. October 8th (part I) : Saoirse Ronan (sadly) elects not to insult or otherwise injure autograph dealers at the premiere of "On Chesil Beach". October 8th (part II) : since I'd be missing tomorrow's premiere due to a conflict with a Composer talk, it made sense to do a second premiere on this day, for 'Last Flag Flying' with Bryan Cranston. October 10th : Got an autograph, photographed, and got to listen to director David Fincher give a BFI Screentalk (on directing, as well as his new series 'Mindhunter'.) Worth it! October 11th : A more musical premiere than most, for 'Film Stars Don't Die in Liverpool'. October 12th : Burgers almost seemed preferable to premiere mayhem at the premiere for "The Killing of a Sacred Deer". October 13th (part I) : Matt Damon didn't, but Christoph Waltz and writer/director Alexander Payne did attend the BFI LFF premiere for 'Downsizing'. October 13th (part II) : The Stars (minus Willem Dafoe) did eventually show up once the carpet was clean enough for the BFI LFF premiere of "The Florida Project". October 14th (part I): A brand new layout for a strange (but arguably cool) BFI LFF premiere - and Joaquin Phoenix eventually did take off his glasses - at the premiere of "you were never really here". October 14th (part II) : Immediately after the Joaquin Phoenix premiere, I walked briskly down to Whitehall to catch the tail end of the 2017 BFI Awards. October 15th. Even I couldn't believe I'd finally managed to photograph (a) Woody Harrelson, (b) Frances McDormance, (c) Sam Rockwell AND (d) Peter Dinklage for the first time, all at the same premiere : for 'Three Billboards Outside Ebbing, Missouri' to close out BFI LFF for 2017. Summary Journal : October 3rd - 15th. Even if they never acknowledge how hard I work (!) for (?) them (? ), BFI London Film Festival is cool enough that it warrants a summary 'Red Carpet Monochrome' journal, I say. 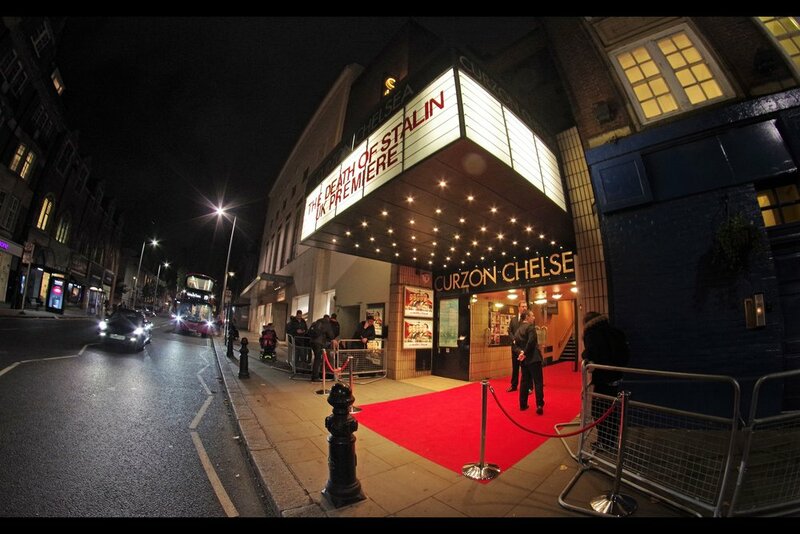 October 17th : I'd say it was a sub-par premiere at which interesting people were photographed : at the 'Death of Stalin' premiere held in a small cinema in Chelsea. October 20th : I'm still not 100% sure I'm allowed to post these photos, but if you're reading this Royal Albert Hall, know that I'm doing it with intentions of Peace and Love : the 'Michael Giacchino at 50' Birthday concert featuring some world-class guests (and music) was awesome. October 30th : The current prime minister, opposition leader, and 3rd in line to the throne were all present at the Pride of Britain Awards... and I'm not British so my patriotic juices were under control. November 2nd : It was the World Premiere of 'Murder on the Orient Express', and I don't think I've ever had a spot this good at a premiere this big before! November 5th : The whole cast attended the World Premiere of 'Paddington 2' - held under a bridge on a cold weekend morning. November 16th : DJ Impact dressed as an Elf, host Alex Zane dressed as the Carpet, and Will Ferrell, Mark Wahlberg, John Lithgow and Mel Gibson attended the premiere of "Daddy's Home 2". November 21st : Just like last year, the Netflix series 'The Crown' had a season premiere in Leicester Square. December 3rd : Cate Blanchett (along with Sir Patrick Stewart, Andrew Garfield, Glenda Jackson, Keira Knightley and Poppy Delevingne) attended the Evening Standard Theatre Awards. December 4th : And just one night later, it was the "The 2017 Fashion Awards" at the opulence of Royal Albert Hall, featuring such notables (?) as Naomi Campbell, Donatella Versace, P!nk, Zendaya and Poppy Delevingne. December 6th : Idris Elba and Jessica Chastain were the main draws, but director Aaron Sorkin, composer Daniel Pemberton and the REAL 'Molly' in "Molly's Game" also attended the premiere. December 11th : It was a cold and dark night... and there was a Burger joint with a view of proceedings that was considerably warmer and overlooked it all, at the premiere of "Darkest Hour". December 12th : The only premiere this year whose journal comes in two differently-shot, cropped and edited flavours : Star Wars : The Force Awakens : in both 'regular / colour + commentary' (above) and 'red carpet monochrome' (below) versions. So.... hopefully until next time... in 2018? Feel free to follow me on Facebook at premieresdotco, or on twitter at berndt2_photo... or if you know how RSS Feeds work, why not tell ME so I can know?